A broken Lenovo ThinkPad Edge E545 screen need not be a cause for concern. Armed with the correct knowledge, you should be able to successfully replace your broken screen quickly and efficiently. What's more, in replacing your laptop screen yourself, you could save valuable time and money. Before beginning your repair, you should a.) Unplug your laptop from the mains power and, b.) Remove the battery. You should also make sure that you have disconnected any peripheral devices, (eg. memory sticks and/or speakers.) Next, use your fingers or a flat edged implement, (a debit card or razor,) to remove the aesthetic covers from the four corners of the front bezel. Once you've removed the aesthetic covers, remove the screws hidden underneath. 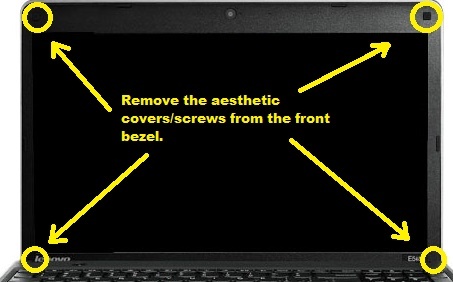 Use your fingers or a flat edged implement to prise the front bezel away from the laptop. Work your way around each edge of the front bezel, easing it away from the broken screen. When you are convinced that you have loosened the front bezel sufficiently, remove it from the laptop and, set it aside safely. You should see four screws, (two in each of the bottom corners,) holding the exposed screen in place. Loosen each of these screws. Then, remove six further screws, (three on each side,) located on each side of the display. Take hold of the top of the broken screen and, gently pull it towards you. Lay the broken screen, face down, on the laptop keyboard. 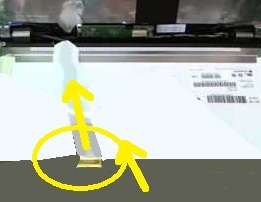 Disconnect the large cable (on the back of the screen) attached to a gold connector. Feel free to peel back any strips of tape or adhesvie in the process, if necesary. Remove the broken screen from the laptop. To successfuly fit your replacement Lenovo ThinkPad Edge E545 screen, simply follow the instructions, as outlined above, in reverse.